PALACE IN THE CENTER! HOSTEL with turn of the century charm! Eclectic palace, the stained glass windows and other works of art nonetheless keep secrets of long past times offering peace and calm within the center of the city! Vaci Street with range of restaurants and shopping venues is just on the corner. Danube promenade, Elizabeth and Chain Bridge, Parlament, Basilica, well-known Gellert and Rudas spa are inside a few mins walk. The hostel is loocated right in the centre of downtown but on a noiseless steet. The rooms and bathroom were extremely clean which was suprising becuase the entrance hall location is extremely old and not so clean. There was not much of a have a look at time which makes items easier. The building is just amazing. Along with the locaton inside the centre also! 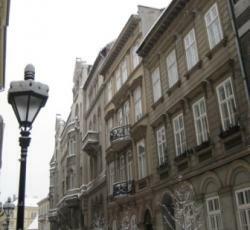 The next time, we come to Budpest, we wish to stay at the same hostel! The building is just amazing. And the locaton in the center also! The next time, we come to Budpest, we need to stay at the same hostel! * Palace Tokolyanum rated 4.4 out of 5 based on 5 customer reviews. Hostel reviews with a star rating are sourced from HostelBookers. If you find Palace Tokolyanum with the same booking conditions at a lower rate somewhere else on the internet after you have booked, we will refund you the total difference.